I realise it’s been several weeks since I posted my last blog about the project. We’ve all been very busy indeed. Vivien has been working on a web exhibition of the illustrations in Thomson’s collections that are related to Burns and his songs, and this is about to go live on our project website here. It will mark the sad event of Burns’s death on 21 July 1796. But it is a good way to remember him so do look out for it! There is a wide range of different kinds of visual representations of Burns himself, of various of his songs (including ‘John Anderson my jo’ and ‘Duncan Gray’) and there is also a moving little vignette illustration which marks the early memorialisation of Burns as our ‘genius’ native poet. Some of the images, notably those by David Allan, are really detailed and illuminating of how other artists saw Burns or interpreted his work in the early years of the 19th century. In the meantime Gerry McKeever has done a brilliant job transcribing all the texts of songs Burns sent to Thomson within his letters…there are 56 letters in all, and most of them include at least one song text. While the letters have already been edited (by J De Lancey Ferguson and most recently by the late G. Ross Roy) these editions don’t include the song texts in full. So we’ve been creating a new transcription of these from films of the manuscripts which are now held now in the Pierpont Morgan Library on Madison Avenue in New York. 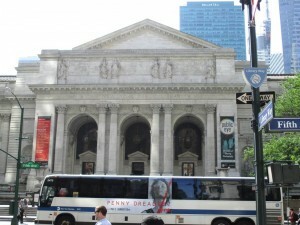 My task in the past month was to take Gerry’s transcriptions and to visit New York to check our transcripts against the real thing! This is the moment where I note how wonderfully privileged the life of an academic can be! I had the most wonderful time, working in detail with Burns’s letters in this beautiful place. 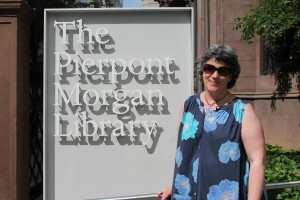 The Morgan library has a newly built reading room with all the things a scholar needs. The staff were wonderful and looked after all my needs for additional reference books and the like. I really was made to feel very welcome. 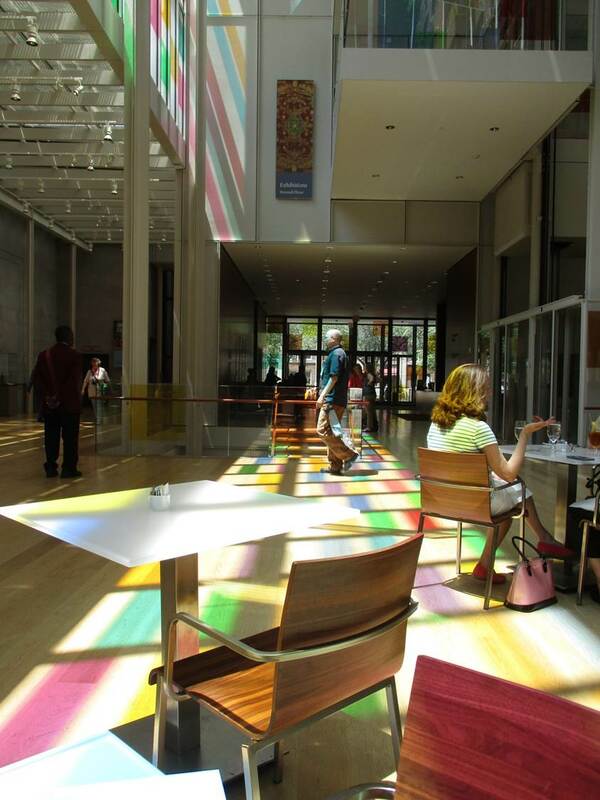 I checked all the texts against the manuscripts and came back with a list of things for us to discuss in more detail . Last week we spent another day working through these and we now have what we think is a good solid base text to work from. We can now be sure what changes Thomson made to Burns’s songs before he published them himself! 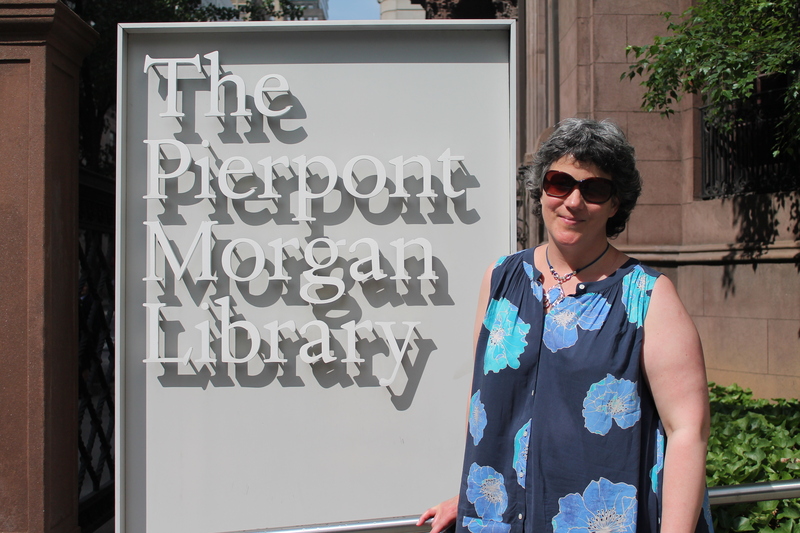 During the week I spent in Manhattan I also had a Saturday to visit the inspiring New York Public Library – where I spent some time in its Pforzheimer collection of books and manuscripts from the Romantic period. It’s really related most closely to the Shelley circle – but they have some Burns manuscripts too. And I was able to see some of the manuscripts of the Irish poet and songwriter Thomas Moore alongside these. No trip to New York for work on Robert Burns would be complete, however, without a walk up to Central Park to pay homage at the John Steele sculpture of Burns – it sits almost directly opposite his sculpture of Walter Scott – so it was well worth it! 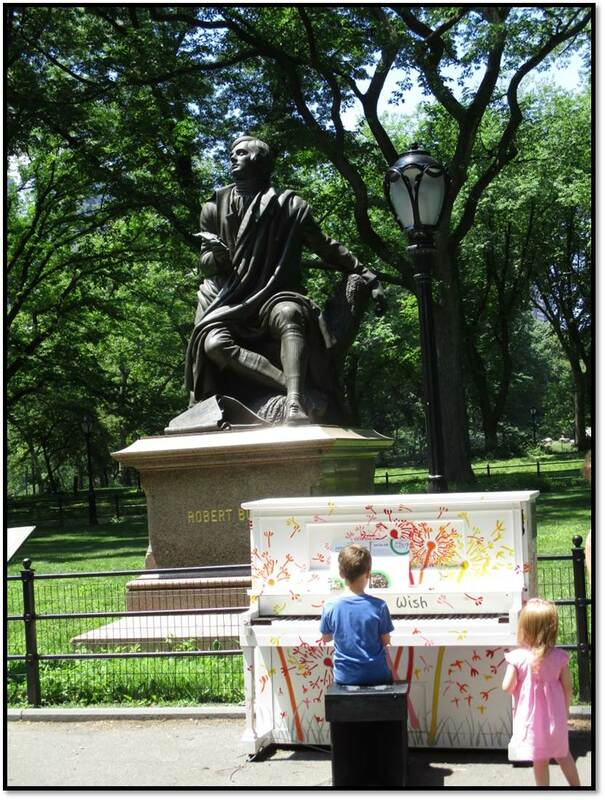 I spent a while in the warm sunshine also quite tickled to find that Central Park’s ‘Piano in the Park’ scheme had placed a brightly painted upright next to Burns! 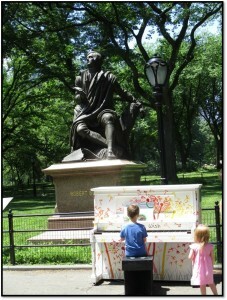 The musicians of New York, young and old, tootled away at Burns’s feet! I wonder what he’d have made of it all! ?